So you have finally decided to buy that boat you have spent months dreaming about. BEFORE you do, you need to read this! Buying a boat is an exciting and daunting decision but there are other things to consider than just what kind of boat you want to own. You will also need a trailer or boat loader. The question is, will you need a small boat trailer with a single axle, a large twin axle trailer or a boat loader for your car or caravan? Here are a few things you need to consider before signing on the dotted line. Don’t make the mistake in thinking that all boat trailers are the same, they are all different and they are all design with a different purpose. Take your time and do your research before jumping in the deep end. You should consider the following before making any boating trailer decisions. What kind of boating? – The very first question you should be asking yourself is ‘what kind of boating do I plan on doing?’. Will it be wakeboarding? Speed boating? Or perhaps just making the most of the creeks and lakes in your local area? Answering this question is crucial in selecting the right boat trailer for you. Steel or aluminium, which is best? – Both materials are great and do their job well, but depending on the answer you gave for your boating activities will depend on which is best for you. Steel is very popular in boat trailers as they are highly durable. Ideally, your boat trailer will be galvanised steel which makes it the ideal option for salt water boating. Steel boat trailers are easy to paint; this not only offers owners the opportunity to match their boat and trailer, it also adds an extra protective coating which makes it last longer. Aluminium is lightweight and extremely durable, which is why it is commonly seen out on the water. Ideal for fresh water, they are typically rust resistant and more affordable. Size – Not unlike your average box trailer, your boat trailer has a gross vehicle weight rating which determines the maximum amount of weight the boat trailer can carry. When doing your comparisons it is important that you include the weight of the boat with its engine. In addition to the fuel and the gear you typically carry on board, plus an extra 10-15% just to be on the safe side. It is extremely dangerous to overload your boat trailer, for not only you but for others as well. Boat and trailer – The type of boat you purchase will determine what trailer you will need. If you opt for an aluminium boat with a Gross Trailer Mass of under 750kg, a small unbraked trailer with a single axle would be ideal. Single axle boat trailers generally require less maintenance and are cheaper than the dual axle trailers. Using the trailer – Can you drive with a trailer? Reverse or park a small boat trailer? If you have opted to go with a single axle trailer, you are in luck because they are easier to manoeuvre around and into driveways as well backing down into the creek. TIP: It is crucial that regardless what large or small boat trailer you purchase, you must hose it down after every use in salt water. Researching before going in to buy a trailer will not only save you time and money, it will also ensure you get the right boat trailer for your specific needs. 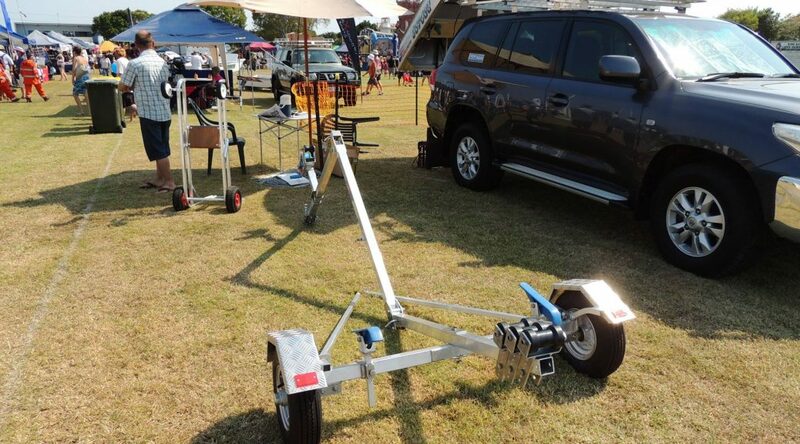 Talk to the specialists at Almac Trailers to discuss whether a small boat trailer is for you! Call the trailer experts on 07 4152 3737 TODAY!